At 17 years, four months and 13 days, Adam May stepped off the Pompey bench for his debut against Bury. 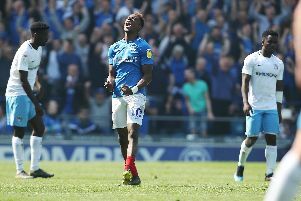 The latest Academy product blooded in a campaign which has been a brutal disappointment in terms of Fratton Park expectations. Nonetheless, the production line is one aspect of the club which continues to deliver. Conor Chaplin was handed his Blues bow in December, recording a first senior goal against Morecambe this month. Meanwhile, first-year professionals and local youngsters Ben Close and Bradley Tarbuck have both made their Football League debuts this term. Then there is Nick Awford, an Academy graduate who started four matches before his release in February. In addition, youth-team keeper Alex Bass has been an unused substitute in four fixtures. Mark Kelly and Mikey Harris took on their Academy roles in the summer after Andy Awford and Paul Hardyman stepped up to the first team. Yet there has been no slowing down in young talent off the conveyor belt. And under-18 boss Harris is convinced others are poised to follow. He said: ‘Seeing the likes of Adam and Conor in the first team on Saturday is what it is all about for us – and has not only happened this year. ‘You’ve got Ben Close getting his first league start against Bury and doing really, really well. ‘You’ve also got Adam Webster, Dan Butler, Jack Whatmough and Jed Wallace. We’ve produced some players at this club over a period of time and that is something everyone can be proud of in the Academy. ‘I believe we have some good boys in the system coming through at all age groups and we can provide that talent for the club’s first team in the future, which is what you need if we are to progress as a football club. ‘You need to be producing your own players and I am confident with the staff we’ve got and players in the system that we can do that. May, a first-year scholar, is set to again feature in Gary Waddock’s squad for Saturday’s trip to Mansfield. The midfielder has scored four goals in 26 Academy appearances this season – and Harris is delighted with his ongoing development. He added: ‘Adam is a central midfield player and – if he keeps progressing the way he is and keeps working as hard as he does – I think he can become a complete midfielder. ‘He can tackle, he can pass, he can score goals, he can win his headers, he’s an athletic lad as well. ‘He’s got to keep focused, keep working to stretch himself and be the best he can be. We will see where it gets him. ‘It’s nice recognition for all the staff within the Academy when the lads graduate. That is what our role is and to have those two come through this season has been a real positive. ‘The next thing is for them to cement themselves in the first-team squad and then the first team, that’s the goal.